What is Physics in Advent? 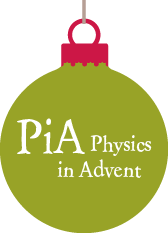 PiA – Physics in Advent is an Advent calendar with a difference: a physics Advent calendar. It enables us to present 24 small, simple experiments and physics mysteries to young researchers and anybody who enjoys things like this. Our aim is to awaken your interest in doing experiments yourself or to make it exciting to watch them. In 2015, “PiA - Physics in Advent” was presented as a MINT-DIY project and won second place in the innovation prize awarded by Göttingen rural district council. How does Physics in Advent work? Each day from 1st to 24th December there is a video clip of an experiment which you can do yourself afterwards. You can then answer the questions on the website and also watch a video of the solution to the question asked by the experiment. In addition to the fun of experimenting, you can win something, too. To take part in Physics in Advent, you have to re-register every year – registration is possible from 1 November onwards. On registration, you will receive your own account and thus always have an overview of the tasks and the solutions you have submitted. At the end of Advent, i.e. on 25th December, you can see your total points and - if you have chosen this option when you registered – take part in the prize draw. In any case, you can then print out your own certificate. You can register as an individual person, a class, group or school. The tasks are published daily at 5:00 am in your own time zone and can be viewed on our website. You can submit your solution up to 11 pm on the same day by selecting one of the four answers given (multiple choice). The tasks on Saturday and Sunday are an exception here. The answers on these days can be submitted until 11 pm on the following Monday evening. The films with the solution are also available from 8:00 am on the morning after the solution deadline. They can also be viewed on our website. The solutions to the weekend questions are available on Tuesday at 8:00. We realise you cannot always do every experiment because you have to do homework for school and you have other hobbies, so we have included some jokers. If you have any jokers left, they are played automatically after the solution deadline has passed if you have not answered a question at all or your answer is not correct. You have two jokers available at the start. You can earn yourself two more jokers by watching 10 PiA solution videos for each joker. It is best to do the experiments with a group of friends or with your family. This is more fun and you do not need or use as many things as you would when experimenting on your own. You can still submit your solution regardless of what the others in your group think. The shopping list for the materials for all the experiments can be downloaded from November onwards in the “Advice of the day” so you can obtain the materials in advance. Take a look at what you need when you watch the task video for the first time. You could maybe get anything you are still missing on the way home from school or ask a nice neighbour. Before submitting your answer, you should always take another look at the “Advice of the day”. When we become aware that there are misunderstandings or difficulties with an experiment, this is where we will provide you with additional explanations and assistance. If some things are still not clear after you have looked at this, you should always contact us via the contact form before submitting your solution. Who may take part in Physics in Advent? Pupils in classes 5 to 10, i.e. aged 10 – 17, groups of classes or entire schools may take part. Younger or older pupils, their parents, students, teachers and people of any age who are interested in physics are welcome to take part as individuals or in groups. Are you interested in further projects, puzzles and competitions? At the beginning of each question or answer video, you see three stations of the PiA chain reaction. Here you can see the complete chain reaction movies. Try to build one yourself!